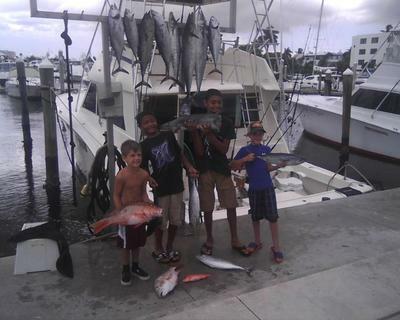 When I first spoke with Clayton when he rang us up and said he wanted an all day Ft. Lauderdale Fishing Charter for his family I suspected that this would be a good charter as Clayton has quite a bit of experience and he basically said it was all about the kids. We fish a lot of kids and young adults so that was familiar territory for us. And this charter was all about the kids. We got Clayton and his family all set for a trip as close in behind tropical storm Chantal as possible. Fishing right after these storms pass by is often very good as long as the system doesn?t dirty up the water too much because of heavy seas and wind. Chantal was a good situation as while her passing across Florida from the Gulf and into the Atlantic just above us affected the upper atmosphere and the Barometer the weather was decent here with the usual scattered showers. Typical summer day. With Clayton and his family aboard Capt. Kopper and 1st mate Brian headed offshore. Now Clayton had much more than a little experience in the salt and he and Kopper discussed the fishing options on the way out the inlet. Captain Kopper informed me that Clayton and his wife were essentially observers for the fishing trip and turned the kids loose on the rods. As you can see two nice Mutton Snappers were part of the catch along with some Kings and Bonito. The photo is of Clayton?s boys and their nephews (black shirts). Brian filleted their catch at the fish cleaning station and plans were made for dinner. It was a fun trip and Clayton dropped us a nice note about the fun they all had today and we want to thank he, his wife and those Junior anglers for joining us.